NOTICE: Requires the base game Hearts of Iron IV in order to play. Activation key must be used on a valid Steam account. Requires internet connection.About the game History forged the ties. Empire made them tighter. 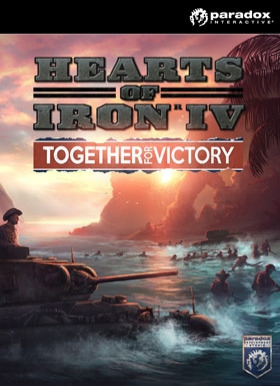 Can war tear them apart?Join the Dominions as they step up to the challenge of defending the motherland for King and Country in Together for Victory, the first major expansion for … Hearts of Iron IV, the critically acclaimed strategy wargame from Paradox Development Studio. This expansion puts the focus on British Commonwealth nations, deepening the experience of playing these outposts of the English language. Key Features New national focus trees and events for Canada, Australia, New Zealand, The Raj (India) and South Africa	Alternate historical path for each of the Dominions, with options to stay loyal to Great Britain, or forge a new, more independent destiny	New autonomy system giving subject states degrees of independence from a foreign master	Changes to Lend-Lease allow you to ask your allies to send you desperately needed equipment A Spearhead battle plan command allowing more control over grand encirclements and punching through enemy lines Technology sharing will allow Commonwealth nations to quickly catch up with British assistance Land Battle log: Learn by past victories or defeats. Giving you history over recent battles. and statistics on equipment losses, you can see exactly how your troops are performing. *This will be included in the Field Marshal Edition	System Requirements	Windows - Minimum OS: Windows 7 64-bit or newer Processor: Intel Core 2 Quad Q9400 @ 2.66 GHz / AMD Athlon II X4 650 @ 3.20 GHz Memory: 4 GB RAM Graphics: ATI Radeon HD 5850 or NVIDIA GeForce GTX470 with 1GB VRAM Storage: 2 GB available space Sound Card: DirectX Compatible Sound Card DirectX®: 9.0c Controller support: 3-button mouse, keyboard and speakers Special multiplayer requirements: Internet Connection or LAN for multiplayer Multiplayer: Up to 32 other players in multiplayer modeWindows - Recommended OS: Windows 7 64-bit or newer Processor: Intel Core 2 Quad Q9400 @ 2.66 GHz / AMD Athlon II X4 650 @ 3.20 GHz Memory: 4 GB RAM Graphics: ATI Radeon HD 5850 or NVIDIA GeForce GTX470 with 1GB VRAM Storage: 2 GB available space Sound Card: DirectX Compatible Sound Card DirectX®: 9.0c Controller support: 3-button mouse, keyboard and speakers Special multiplayer requirements: Internet Connection or LAN for multiplayer Multiplayer: Up to 32 other players in multiplayer modeSupported GPUs at time of release: AMD GPUs: 5850 series or higher, 6870 series or higher, 7850 or higher, R7 260 or higher Nvidia GPUs: GTX470 or higher, GTX560 or higher, GTX660 or higher, GTX750 or higher, GTX 950 or higher Laptop GPU dedicated cards may work if they are on par with their desktop counterparts, but are not officially supported. Mac - Minimum OS: Mac OS X 10.10 or better Processor: Intel Core i5 @ 2.60 GHz Memory: 4 GB RAM Graphics: ATI Radeon HD 6970M Storage: 2 GB available space Sound Card: DirectX Compatible Sound Card Additional: GLSL 1.3, OpenGL 2.1 Controller support: 3-button mouse, keyboard and speakers Special multiplayer requirements: Internet Connection or LAN for multiplayer Multiplayer: Up to 32 other players in multiplayer mode Mac - Recommended OS: Mac OS X 10.11 or better Processor: Intel Core i5 @ 2.90 GHz Memory: 8 GB RAM Graphics: ATI Radeon R9 390M or NVIDIA GeForce 750M with 1GB VRAM Storage: 2 GB available space Sound Card: DirectX Compatible Sound Card Additional: GLSL 1.3, OpenGL 2.1 Controller support: 3-button mouse, keyboard and speakers Special multiplayer requirements: Internet Connection or LAN for multiplayer Multiplayer: Up to 32 other players in multiplayer mode Linux - Minimum OS: Ubuntu 14.04 LTS x32 or better Processor: Intel Core 2 Quad Q9400 @ 2.66 GHz / AMD Athlon II X4 650 @ 3.20 GHz Memory: 4 GB RAM Graphics: ATI Radeon HD 5850 or NVIDIA GeForce GTX470 with 1GB VRAM Storage: 2 GB available space Sound Card: DirectX Compatible Sound Card Linux - Recommended OS: Ubuntu 14.04 LTS x64 Processor: Intel Core i5 750 @ 2.66 GHz / AMD Phenom II X4 955 @ 3.20 GHz Memory: 4 GB RAM Graphics: ATI Radeon HD 6950 or NVIDIA GeForce GTX570 with 2GB VRAM Storage: 2 GB available space Sound Card: DirectX Compatible Sound Card Supported GPUs at time of release: AMD GPUs: 5850 series or higher, 6870 series or higher, 7850 or higher, R7 260 or higher Nvidia GPUs: GTX470 or higher, GTX560 or higher, GTX660 or higher, GTX750 or higher, GTX 950 or higher Laptop GPU dedicated cards may work if they are on par with their desktop counterparts, but are not officially supported.